Donna Brazile's revelations* didn't come as a surprise. Everybody knew that the Clintons sank the party they helped reform a quarter of a century earlier. Well we knew for the political part, but the financial dimension is so much engrained in their fabric that this latest scandal makes perfect sense. I don't feel sorry for Bernie Sanders, who would have lost anyway, but for a country that should never have lost its most vital institutions to its worst enemies. I'm glad this comes out now. Not as a distraction to the Russia probe, but to silence Hillary, who hijacked the conversation thanks to her book tour, poisoning minds with the notion that the DNC remains totally under her spell. We badly need different voices. Obama yes, but only on rare occasions, and on essential issues. We don't need grandparents in the Pelosi - Biden - Sanders variety (if they're over 65, make them fun listening to, like Liz Warren or Al Franken - what a 2020 ticket!). We need fresh, new voices, like Kamala Harris, Chris Murphy, or better Deval Patrick, should he return to politics. And the Democratic Party must totally reform itself. Otherwise, the Barry Sanderses, Oprah Winfreys, or Mark Zuckerbergs will dance on its grave. 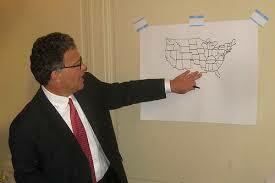 Can Al Franken draw the US electoral map as well? Of course, same goes for Republicans, who must step into the post-Trump era before DJT destroys what's left of it. For the moment, the GOP's soul relies on a 81 year-old with brain cancer (John McCain), two senators on the way out (Jeff Flake with a better potential than filpflop Bob Corker), and the one cool guy who could change it all, Ben Sasse.